Connected inhaler sensor maker Adherium has received 510(k) clearance for US over-the-counter sales of its Hailie sensor, formerly known as Smartinhaler. Specifically, individual versions of the device have been cleared for use with the asthma inhalers ProAir HFA, Ventolin HFA, and Flovent HFA. “This latest clearance kicks off our official entry into the US consumer market, giving the tens of millions of US patients suffering from chronic respiratory conditions their own sidekick for asthma and COPD,” Arik Anderson, CEO of Adherium, said in a statement. 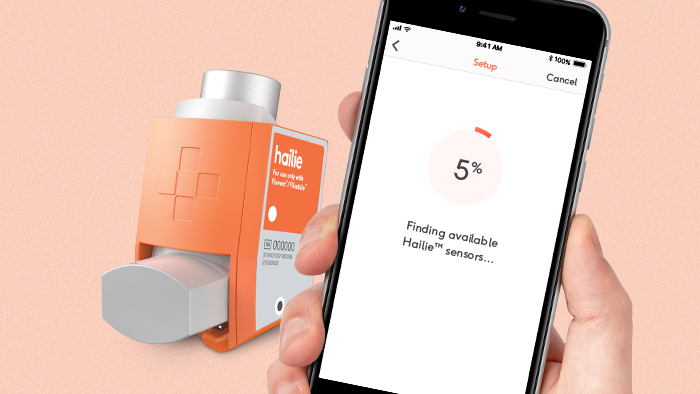 Adherium’s Hailie consists of a sensor on the inhaler and an app that makes data from that sensor available to patients, parents, caregivers, or a clinical team. In addition, the inhaler can be set to remind patients to use it by lighting up, making a sound, or vibrating. The inhaler can also help clinicians pinpoint when and how someone is misusing an inhaler, such as if they are holding it upside down or inhaling at the wrong time. In April, Adherium received a clearance for OTC sales of another Hailie device for use with AstraZeneca’s Symbicort inhaler. In a statement, Anderson said that US patients will eventually be able to purchase the devices through Adherium’s online purchasing page. Of note, descriptions of the newly approved devices on the site specify that the devices only work with the purchase of “a valid Hailie solution subscription.” These subscriptions can cover multiple sensors used by a single person, and come with a minimum subscription period of 12 months for new users, according to the site. In addition, the company also announced that it will be launching an online portal that allows providers to access patient-group data collected and wireless uploaded via Bluetooth by by Hailie sensors. Speaking in January about his company’s upcoming plans for a US consumer launch, Anderson said that he wasn’t concerned about potential competition with other digital respiratory health companies like Propeller Health and Cohero Health due to the breadth of the US respiratory market.